Boys in the San Francisco of the 1950s had the city to themselves. They could go places where now they'd be chased away or where, if they went, their parents would have heart attacks. Here's one safe place close to the boy's home in Parkmerced. 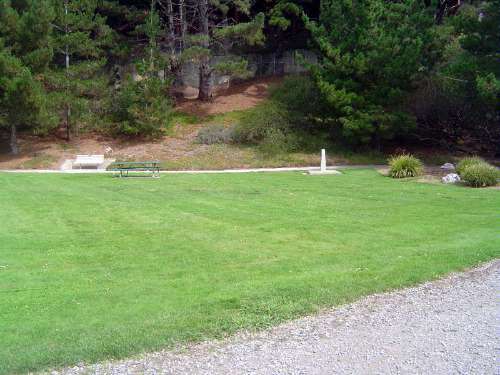 Back in the 1950s you really had to know your way around to find it, however; there was no lawn or anything other than a fairly distant historical marker on the road from Lake Merced to Westlake. It was the site where U.S. Senator David Broderick was mortally wounded by California Supreme Court Justice David Terry in 1859. (Back then, they didn't just throw nasty words at each other. Considering the number thrown today, it kind of makes you wish for the old days.) The boys ignored the particulars and thought only that Broderick must have been a lousy shot to miss at this distance. In the other direction from his home, the boy often went to this shopping center, competely boring unless you knew--as of course boys did--that the stores received shipments from a long tunnel that ran the length of the center, with stairs that led up to doors that opened in mysterious corners of the various stores. 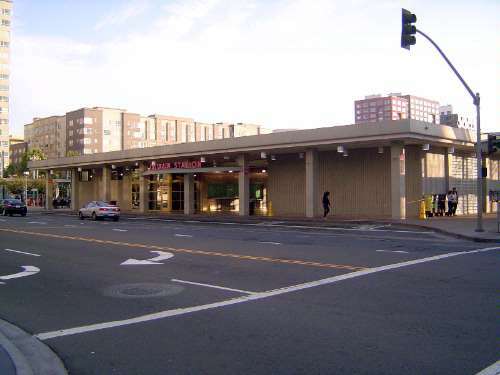 It was a short-lived architectural idea--too expensive--but the boy used the tunnel all the time, coming up into the grocery store, for example, through a door next to the restrooms. 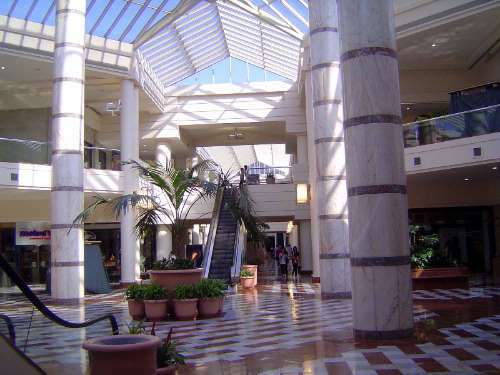 The grocery store's gone and the center has been turned into an enclosed mall. What is Macy's now was then The Emporium. The name galleria is another newfangled stick-on. Can't even ride a bike in here. 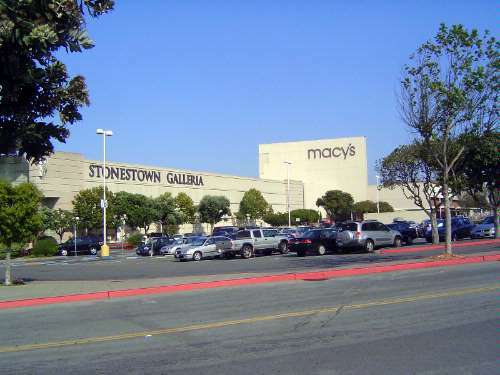 Originally, it was a one-story, outdoor mall. 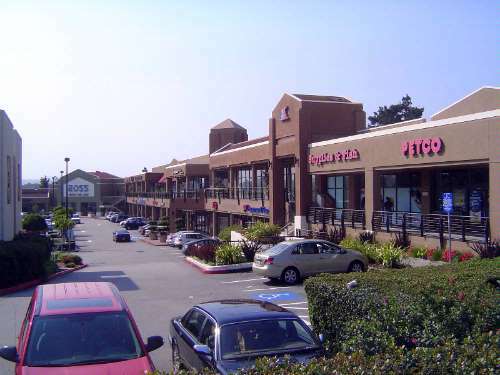 A few blocks farther north is this shopping center, which began life in the 1950s as GET, Government Employees Together. The gimmick was that you couldn't buy anything unless you worked for the government--some government, any government. It worked, too, at least for a while. That Ross in the background was originally the site of a Lucky supermarket. The boy, short on cash, decided to try some hamburger-like dogfood. One taste was enough, but what to do with a pound of the stuff? Eleven-year-olds can be relied upon to have stupid ideas, and the boy neatly wedged the package behind the tire of a parked car, just to make a nice squish. He didn't wait around to inspect the damage. 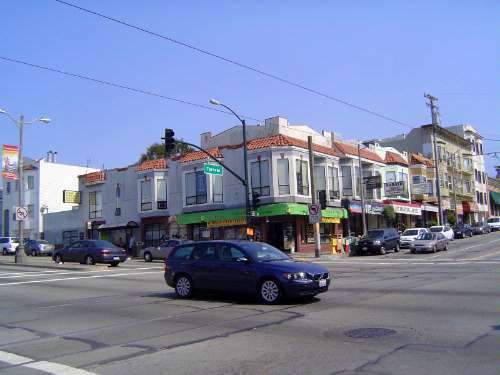 Still farther north, here at 19th and Taraval, there used to be a Mobil gas station at the corner shown here. Tom Brochard was the dealer, and the boy worked for him one summer. Tom was a very patient man. He showed the boy how to put a car on the hoist and how to drain the oil, and he didn't even lose his temper when one day he looked up and saw a cherry-red stream of transmission fluid pouring into the waste barrel. The boy was sorry. The boy sometimes did things right. One day, just on an intuition, he told Tom's partner to step aside from checking a car's radiator. Puzzled, the partner stepped aside just as the car in front, driven by a lady with a shaky command of her clutch, slid back and clanged bumper to bumper. The partner kept his knees, and the boy that day had two big hamburgers, on the house. They came from Zim's, the longtime occupant of the opposite corner. All these places were west of Twin Peaks and the tunnel under them. 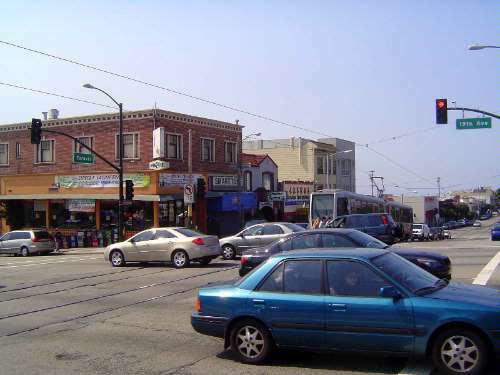 The boy often rode his bicycle downdown over a circuitous route--Alemany by name--but more often took the streetcar. 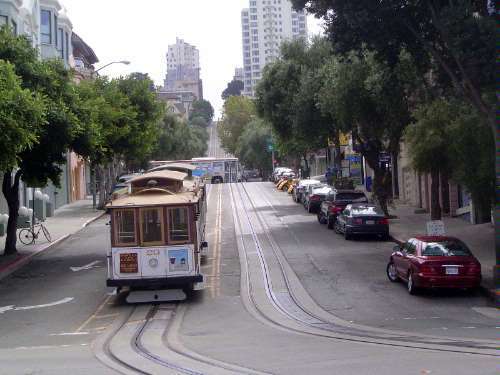 The streetcars of that vintage had an enclosed middle part but open ends, and the boy invariably rushed up front to stand next to the motorman, who clanged the bell with a mechanical floor button. The motormen each carried a wrench-like crank with which they controlled the motors and which was as inseparably attached to each motorman as a stethoscope is to a doctor. All the steelwork here is new; the boy simply saw a concrete arch with the date 1917. You can make out the tunnel entrance on the left. 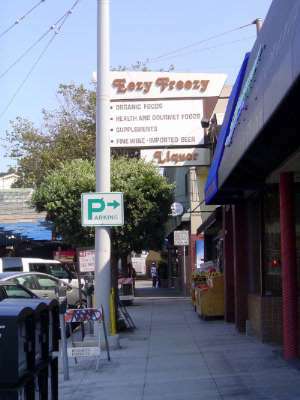 But why a food shop called Eezy Freezy? The clerk in 2009 didn't know, but the man who had been the boy did: it was because fifty years ago people in the neighborhood didn't have home freezers. Instead, they rented big lockers here. They would stick a quarter of a steer in it, along with gratuitous bags of hot dogs. Like Krispy Kreme, freezer lockers had their moment in the sun, but the place today still has a whiff of the old freezer smell, heaven knows how. 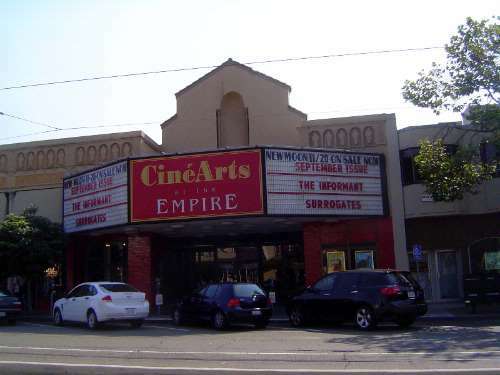 This theater was down the street a few doors. French be damned, it was the Empire Theater, period. Saturday matinee ran maybe 35 cents, for which you surely got a cartoon and two movies. Once through the Twin Peaks Tunnel, the boy continued down Market to Powell, where he caught one of these. The seats would have been punishment. What were those running boards and those vertical white handlebars for, if not to see how far a boy could hang out and what he could touch? 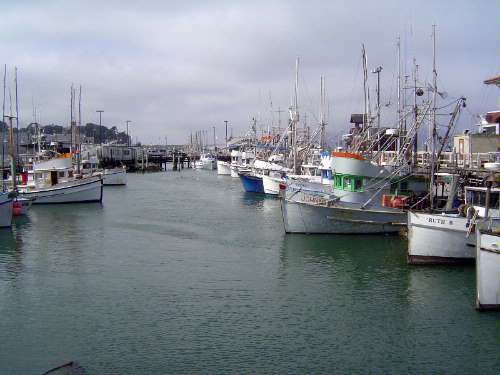 Fisherman's Wharf was a vastly more active place then than now. Salmon was no longer cheap--farmed salmon was unknown--but crabs still were, and there were lots of them. Abalone, too. Here, at the toe of Market Street, was the most fabulous map in the state: a plaster model of California laid flat, with catwalks for access. 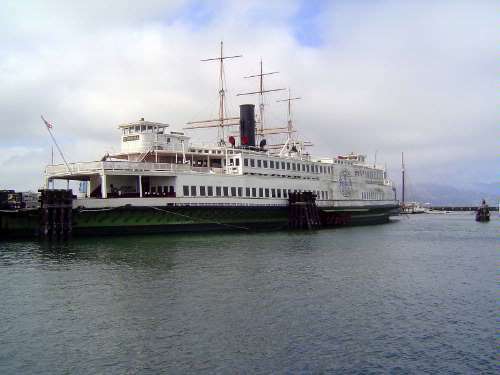 Most of the ferries are gone, but here's one of the survivors, the Eureka, originally used to take railroad cars to Marin County and the line of the Northwestern Pacific, an SP subsidiary running north to Eureka. 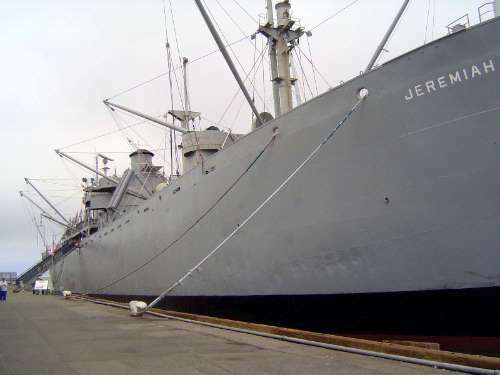 Nearby now, but absent then, is the working-order Jeremiah O'Brien, one of 2,710 identical Liberty Ships. She was built in South Portland, Maine, in 1943--and in the amazingly short period of 56 days. You'd expect her to have diesel engines, but no: steam. 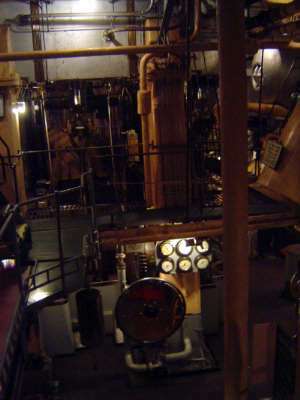 The piston stroke was downward from the cylinder at the top. 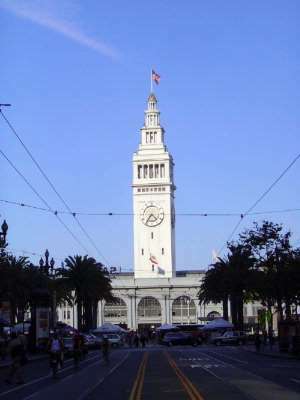 The ferries and ferry building became dinosaurs as soon as this new-vintage dinosaur opened. The view here in an odd one but interesting, because it raises the question about how to anchor cables. Here's the answer, sort of. 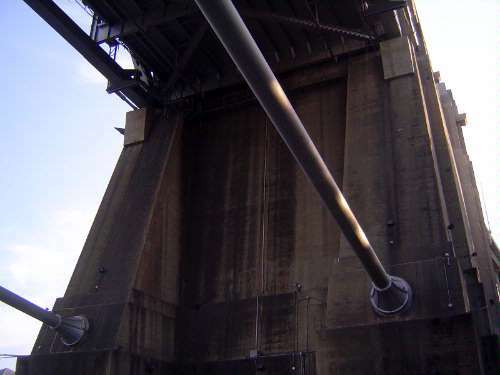 A massive pylon. One of the boy's favorite haunts was nearby. Now it's just a garage, but then it was the printing plant for the San Francisco Examiner. 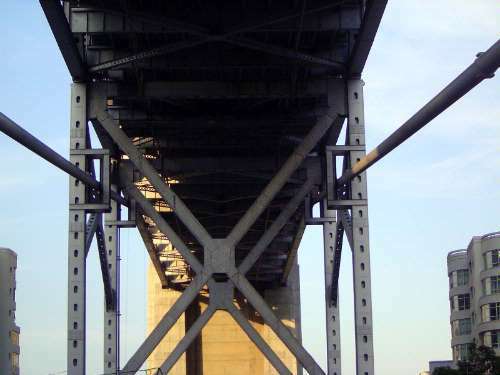 There were at least four sub-basements reached by greasy-inky metal stairs and loaded with 1,500-pound spools of newsprint that were manhandled onto small steel dollies that ran on a miniature railroad. 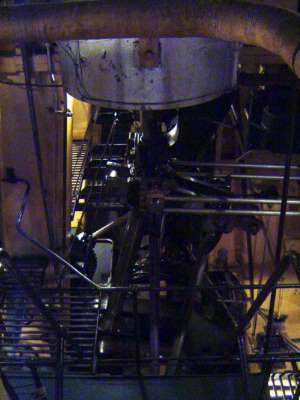 The presses ran with heavy lead plates shaped in half-cylinders and just the size of a newspaper page. The sight of such a press running is familiar from lots of movies, but up close it really was dramatic. And there wasn't a lawyer in sight, or an OSHA inspector. The assumption was that boys would do stupid things but not dumb ones. Did Orson Wells ever see the mighty H? Bets are he did. Upstairs, there were not only news rooms but linotype rooms, interesting to visit, chat, and swipe a slug. 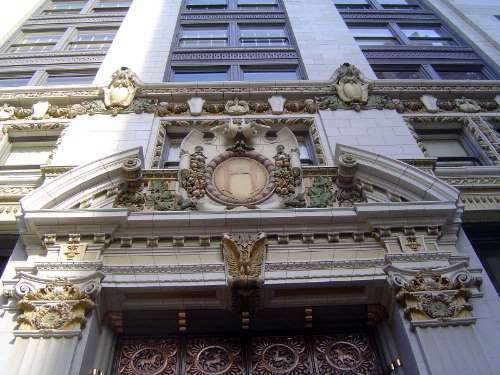 The Hearst building still fronts on Market street; the presses were on the block to the south. Erased: the Southern Pacific's nearby station at Third and Townsend. Built in 1914, it was demolished in the 1970s. Not that San Francisco was ever an important railway center, but two trains--the Daylight and the evening Lark--left here for Los Angeles everyday. Both were pulled by steam engines. So, for that matter, were the many daily commuter trains that ran to San Jose. 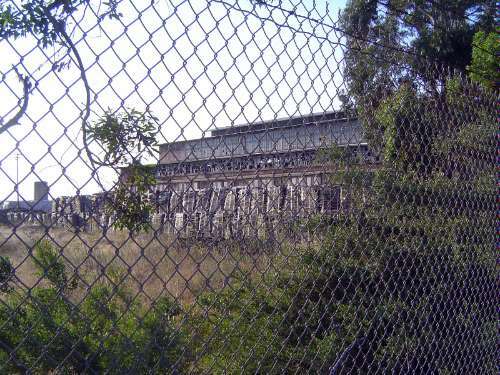 A few miles south of the city, the SP had its huge Bayshore Yard, now abandoned but for a long time stacked full of the railroad's unique, huge, cab-ahead and articulated compound expansion engines. (Sorry, I left out the wheel arrangement: 4-8-8-4.) The engineer could see where he was going and didn't choke on his own smoke. The design would have been impossible with a coal-fired engine, but these babies ran on oil. An old railway maintenance shed at the yard. 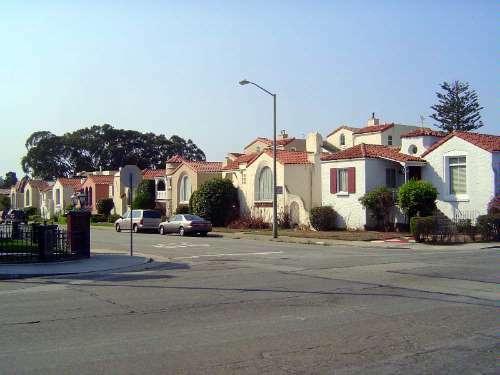 Before the construction of the Bayshore Cutoff, the Southern Pacific entered the city on a route now occupied by Alemany Boulevard. 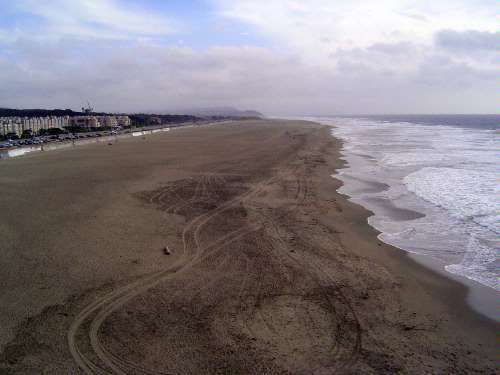 It also had a branch line for a time running along Sagamore Street west to Lake Merced via the dunes that became Parkmerced. Now you know why, in a part of the city where almost nothing is older than 1910, there are a few older houses like this one on Sagamore. Here's the more typical housing stock. It's the Sunset District, the name a marketing-man's willful delusion. Better to call it the Fog District. 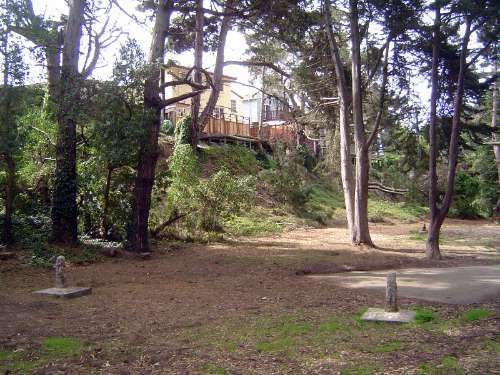 Several builders put thousands of homes on the hundreds of blocks south of Golden Gate Park and west of Twin Peaks. 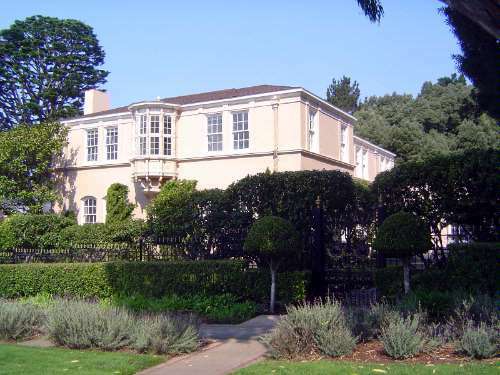 The best known was Henry Doelger, who later built Westlake, still farther south. The boy rode his bicycle this way often en route to Golden Park, shown in the background, and points north. 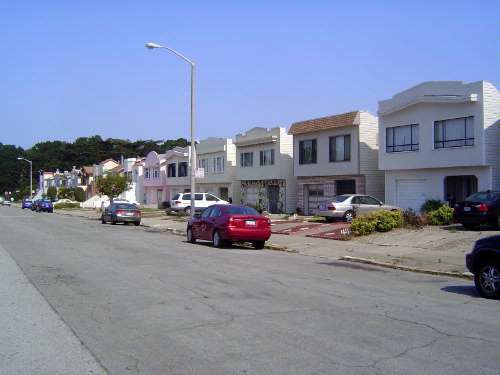 He paid little attention to these houses, which even to him then seemed deadly monotonous. 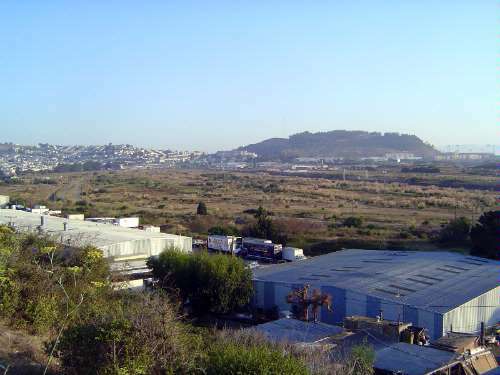 Just before World War II, Doelger built Doelger City, the rectangle bounded by 19th and 27th Avenues and by Kirkham and Quintara Streets. Doelger's competition came from the Gellert brothers, the Stoneson brothers, Chris McKeon and Ray Galli. The boy knew none of this and hardly believed his father, who said that he remembered when all this country was open dunes. 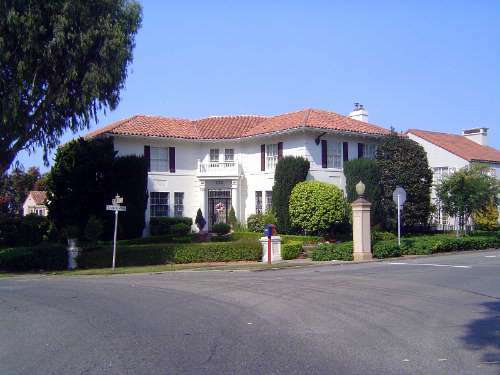 Styles ran from pseudo-Spanish to budget Moderne. Underneath, the framing was redwood. 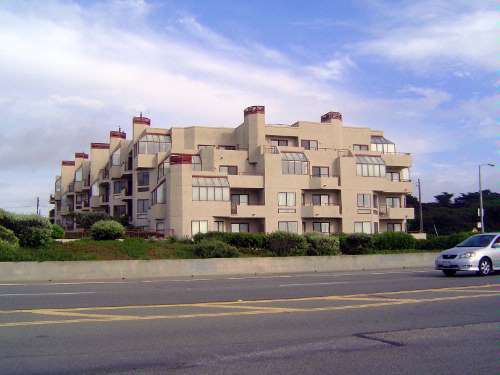 One more view, this time from Ocean Avenue, with picture windows looking at the street. Was there a high end? Of course there was, but that adulatory phrase wasn't in use yet. The boy knew, but ignored the fact, that there were parts of the city where people with money lived. 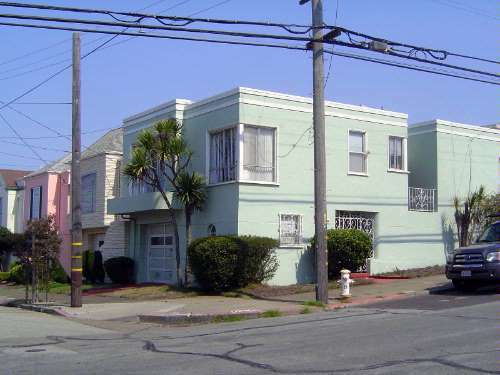 The one on the west side of Twin Peaks was called St. Francis Wood. 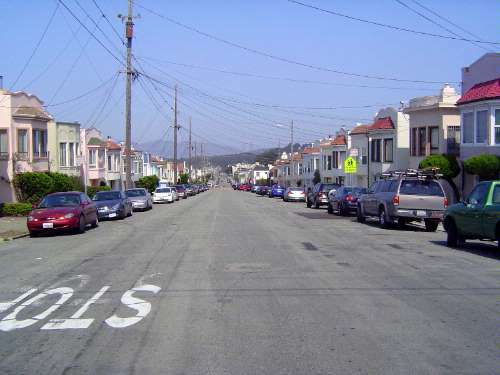 It never occurred to the boy that the developers had chosen the name because this was San Francisco and because the development was located on an afforested tract. He avoided the neighborhood not from class consciousness but because it wasn't on the way to anything. 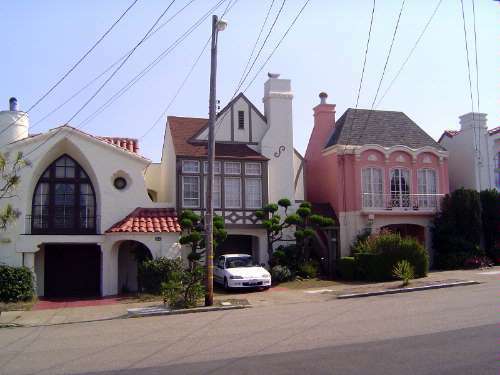 If he had been asked about the houses here, he would have shrugged. 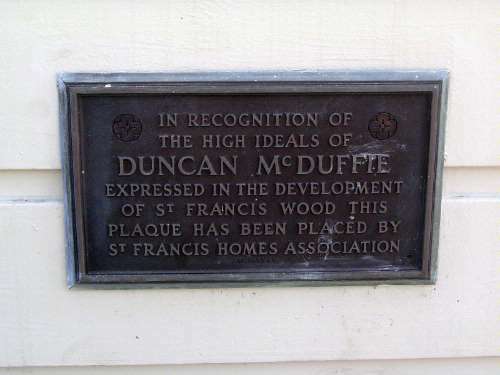 An undated plaque recalls the neighborhood's chief founder, whose name also lingers in the name of the company called Mason-McDuffie. 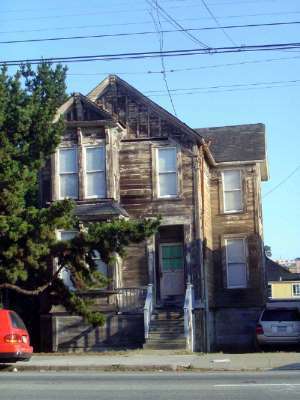 Instrumental earlier in building Oakland's Claremont district, McDuffie was much later president of the Sierra Club. 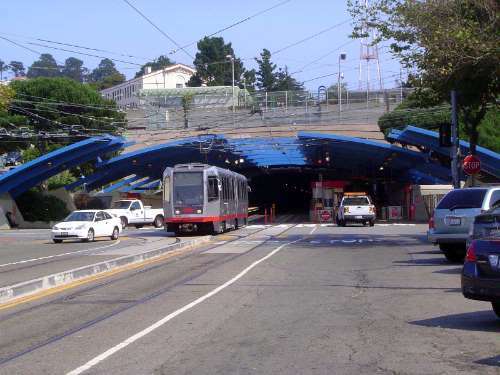 As for St. Francis Wood, established in 1912, sales were slow during World War I but picked up with the completion of the Twin Peaks Tunnel and the extension of Market Street over Twin Peaks. 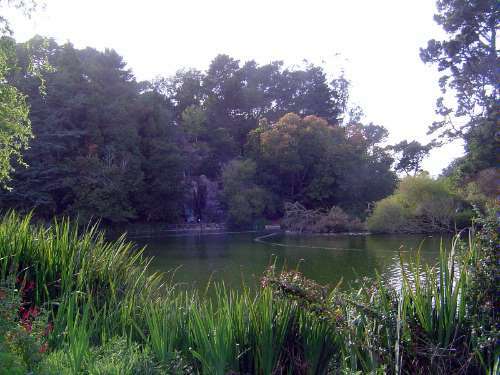 The boy headed sometimes to Golden Gate Park, where he and friends rented boats on Stowe Lake. On the island in the lake, he discovered this stone. 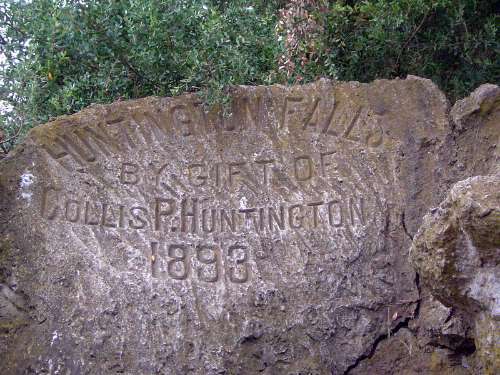 It marked an artificial waterfall that was no longer in use. Huntington, the boy came to know much later, was the brains behind the Southern Pacific. The top of the hill on the island. Lo! 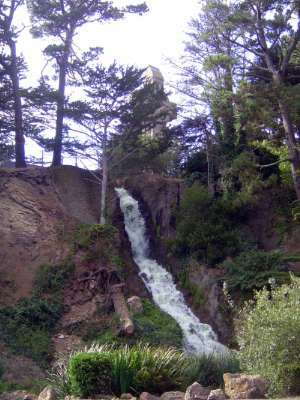 The water runneth again (2009). 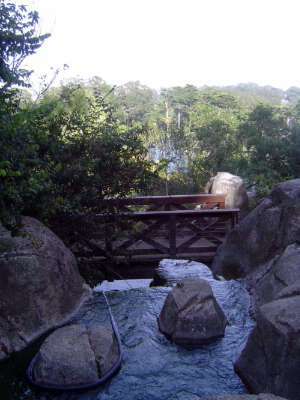 As it also does at a second waterfall, east of the park's buffalo paddock. In the first 20 years of his life, the boy never saw a drop of water here. 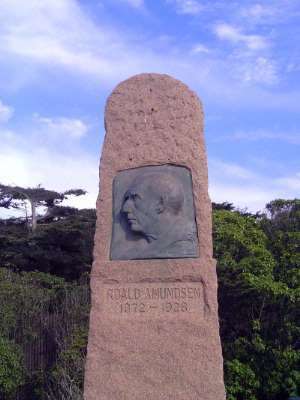 At the western end of the park, facing the ocean, he did often pass the old green Gjoa, the ship sailed by Roald Amundsen through the Northwest Passage. Amundsen had sold it upon arriving in San Francisco in 1906, and for many years it sat behind an iron fence, where it was propped on blocks in a drydock. In 1972 it was taken back to Norway, and this stone set up in its place. 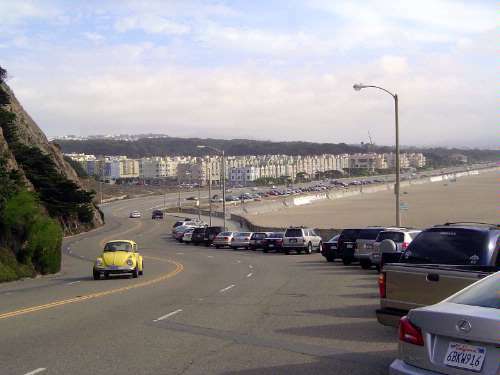 North of Golden Gate Park was Playland-at-the-Beach, a Coney-Island style amusement park with roller-coaster, cotton candy, and--perhaps uniquely--the It's It ice-cream sandwich, a slab of vanilla ice cream sandwiched between oatmeal cookies and dipped in chocolate. 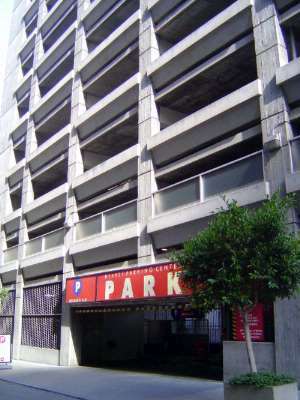 On the site now are the apartments on the left. Behind them and on the right, you can see an arm of one of the windmills supposedly built to produce irrigation water for the park. The boy certainly never saw them turn. The apartments had plenty of windows for a better few of the near-perpetual fog. The least amusing part of Playland survives. 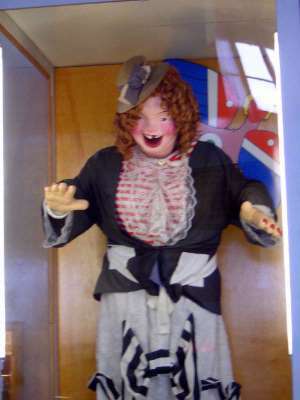 It's the mechanical dummy called Sal, who still accursedly guffaws on a loop, now from a museum near Fisherman's Wharf. The boy found her anything but funny. 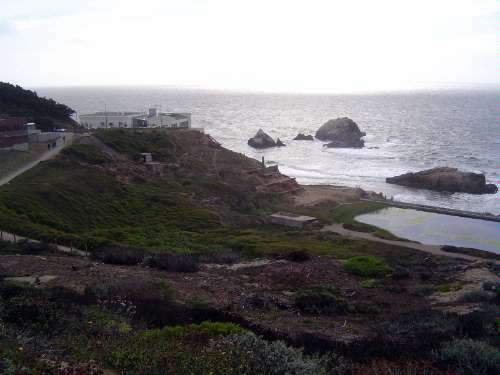 North of playland, the road climbed to The Cliff House, near Seal Rocks and the foundations of what the boy knew as the Sutro Baths. 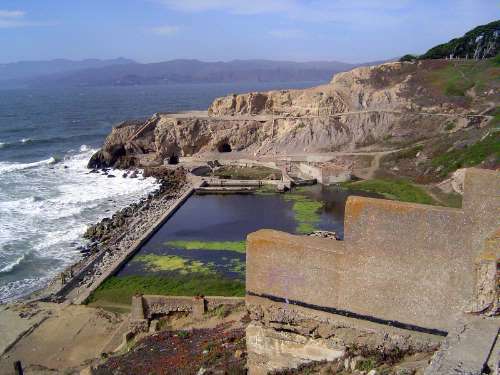 The baths, with several salt-water pools of various temperatures, operated into the 1950s. The boy swam in them but was more taken with the chamber of medieval torture instruments that was part of the adjoining museum. It was very explicit. 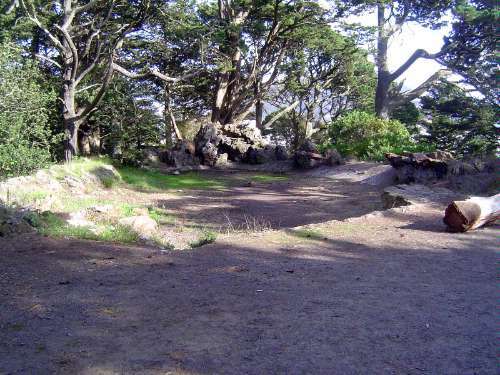 Atop the hill was Sutro Park, donated by Adolph Sutro, the consolidator of the Comstock Lode, a mayor of San Francisco, and eventually a philanthropist. 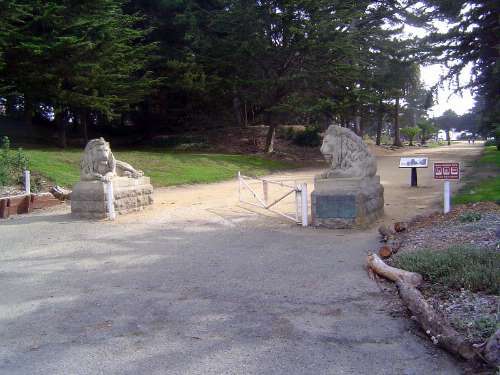 The site originally held Sutro's mansion, which explains the mighty lions. 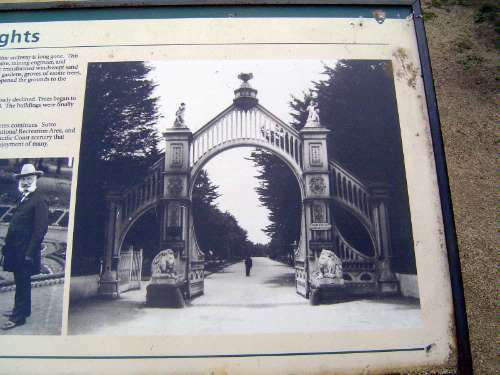 Here, from a sign on the spot, is the site in his time, along with Sutro in his muttonchops. 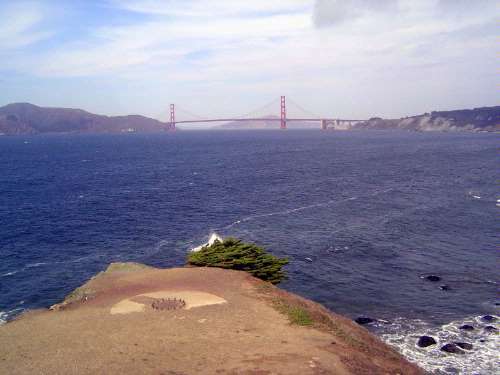 Still farther north were the Golden Gate headlands, with their emplacements for guns. Feel the breeze? It's stiff.